You need to update your blog. You sit down in front of your computer. 20 minutes later, you walk away from the still blank screen in a search for inspiration. First things first: I’m giving you permission NOT to write 7 days a week. Or even 5 days. I’d much rather see you create one great piece a week, than send out 5 mediocre articles. I bet your audience feels the same way. If your business relies heavily on news – then perhaps hire a freelancer to help ease some of the burden. If you don’t have an autoresponder set up yet for new subscribers, get one done right away. Like today. New eyes on your material is a great way to get a fresh look at things you may have missed. It doesn’t matter if you have a survey in place or you just want them to email you – the point is that you want to find out what types of things they expect to learn from you, what they’re hoping you may cover, and what burning questions they have about your niche. Go back through old blog posts and comb through the comments. What types of things are your readers asking about? What products are they mentioning? I’m willing to bet there’s a pot of gold sitting in those comment sections. I know you have a Fan Page and Twitter account set up already – so start asking your followers there the same types of things you’ve asked in your autoresponder. Google Alerts is a great way to have relevant information land inside your inbox. You can do something similar with Twitter as well. You’ll want to make use of keywords that are relevant to your niche so you’ll pull in what others are talking about. And no, this isn’t about pilfering others ideas. Take the idea and put your own spin on it or make the article about your point of view on the subject. On a forum, people are always asking questions and giving their opinions. 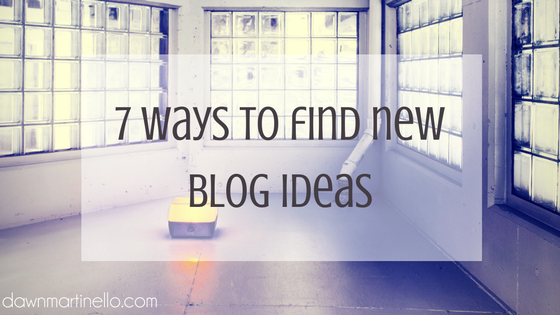 Find a busy one and you’ll have a fresh batch of ideas daily. Check out Amazon. Find a relevant book from your industry and check out the reviews. Gold. Mine. Whenever you can work in a personal story to your piece – do it. We love to be able to relate to one another! Keep a notepad with you all the time. I’m sure there’s been more than one time that a great idea came to mind but you forgot all about it by the time you got in front of your computer.